Africa’s top wildlife safari destinations include wildlife parks in Kenya , Tanzania , Uganda , South Africa , Botswana , Zimbabwe ,Zambia , Namibia and Gabon. If you’re looking for the best safari where you’re almost guaranteed to see the “Big Five” you can’t go wrong with these choices. 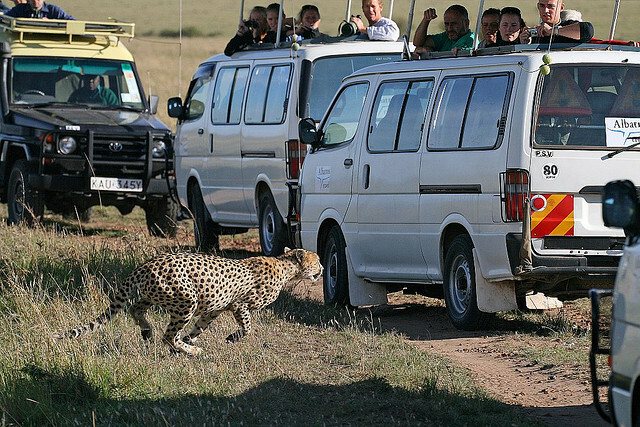 Kenya is Africa’s most popular safari destination and the Masai Mara Reserve is the most popular wildlife park in Kenya. From July – October you can witness the incredible migration of millions of wildebeest and zebra. The Maasai tribesman also offer cultural tours which will enhance your experience. Chobe National park lies in Botswana’s Okavango Delta and covers four distinct Eco-systems. The Savuti marsh in particular offers some of the highest concentrations of wildlife in Africa year round. Chobe boasts around 120,000 elephants, you’re unlikely to miss them when you enjoy a safari here. The best time to visit Chobe is between May and September, the dry, cooler winter months. Herds of zebra, eland, buffalo, giraffe and wildebeest congregate around the Savuti marsh this time of year. Chobe is accessible by car which makes it a little less expensive than some other Botswana Parks. There’s a wide variety of accommodation available to suit all budgets, you can even rent a houseboat. Kruger National Park in South Africa boasts the highest variety of wildlife in Africa which includes the Big Five, hippos, crocodiles, cheetah and more. Kruger is one of the best maintained parks in Africa which means it’s ideal for a self-drive safari. Home of the “walking safari” South Luangwa National Park in Zambia offers a true African experience. There’s plenty of wildlife and over 400 species of birds. The Luangwa river is filled to the brim with hippos and if you’re lucky you’ll spot prides of over 30 lions at a time. There are 60 different animal species and over 400 different bird species living in the National Park. South Luangwa offers both budget and luxury safari lodging. The best time to visit is during the dry season from April to October. Near the end of the dry season, the animals really concentrate around the remaining waterholes, which makes for a great safari. The Serengeti National Park in Tanzania offers the absolute classic African safari setting. The grasslands make the Serengeti fantastic for spotting lion kills because you can see the whole spectacle clearly. The migration of millions of wildebeest and zebra starts here and because it’s much larger than the Mara (see above), it is also less touristy. Bwindi Impenetrable Forest in Uganda is home to almost half of the world’s population of mountain gorillas. Besides offering a wonderful backdrop to Gorilla tracking, you can also see chimpanzees, and many other mammals. Bwindi has been designated a World Heritage Site. Etosha National Park is Namibia’s top wildlife destination. Etosha is home to Africa’s tallest elephants, the endangered black rhino, and 91 other species of mammal. Etosha is especially popular with photographers in the dry season who flock to the waterholes (along with the wildlife). Etosha doesn’t offer scheduled game drives, it’s a self-drive safari experience. Loango National Park in Gabon is probably the least well known park on this list but it’s only a matter of time before it’s discovered. Loango is the only place in Africa where you can see whales, chimps,gorillas and elephants in one park. In Loango you get to enjoy watching wildlife on the beach, savannah, swamp and forest in a single day. The Ngorongoro Conservation area in Tanzania includes the world’s largest crater which acts as a natural enclosure for almost every species of wildlife found in East Africa. The Maasai still live within the conservation area, and it’s also home to Olduvai where some of man’s earliest remains have been found. Hwange National Park in Zimbabwe is a personal favorite of mine because of its abundance of giraffes, elephants, and lions as well as 105 other mammal species. Hwange also has one of the largest populations of wild dogs left in Africa. There are several comfortable lodges to stay at for reasonable prices. The park is close to one of the world’s greatest natural wonders — the Victoria Falls. Why go on a Kenya Safari? Enter your email address to subscribe to The Earth Safari blog and receive notifications of new posts by email.